Posted July 21, 2017 by Norburn Lighting and Bath Centre & filed under New Products . Keeping the party alive after dark is made easy with the newly launched portable LED Lanterns by Kichler Lighting that incorporate Bluetooth technology. These nifty portables have a transitional style that coordinates with existing lines from Kichler and is damp rated so it can be used in both indoor spaces and outdoor areas such as covered patios, decks, balconies, cabins, and poolsides. The lantern connects to any Bluetooth device, which allows users to control the volume and preferred sound at up to a 30-foot radius. The Lantern also relies on a dimmable LED in warm white to create the perfect ambience for any outdoor occasion, and lasts up to 8 hours before it needs to be recharged. 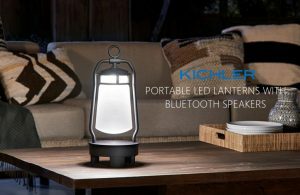 Let us know what you think of the new Lanterns with Bluetooth Speakers from Kichler, and tell us where you would bring it? For more information, contact or visit our showroom, our Lighting Specialist are always happy to help!